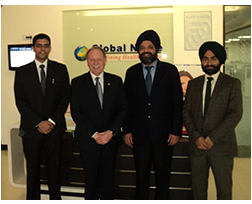 India, February 2013- Dr. Dan Patterson, President, Niagara College was at INSCOL to strengthen our ongoing co-operation. He appreciated INSCOL’s mission to transform Indian Nurses to Global Nurses by improving their knowledge, skills and professional conduct.Dr. Dan Patterson has been designated as Niagara College’s President since 1995. Under his leadership the college has doubled its enrollment and now has over 9,000 full time students in 90+ programs.More than 500 nurse students enroll with INSCOL every year for Niagara College’s Post-graduate Nursing programs in Critical Care, Palliative Care and Mental Health Nursing.